Looking for Tippy Assam Teabags? Believe it or not, for all the different varieties of tea there are only two different types of tea plant – one of which originates in Assam, the Camellia assamica. Our signature Assam has a small neat leaf with plenty of golden “tip”: in other words, the best part of the bush. Rolled in the traditional manner for that authentic Assam taste, it's brilliant at breakfast with a splash of milk. 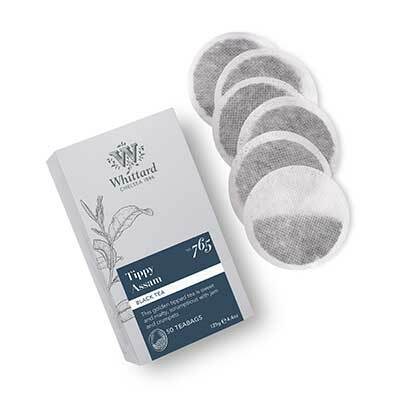 Tippy is my driver, amongst all Whittards' teas, my favourite.rnIt's a clean, malty, fragrant cuppa, guaranteed to combat a bad day and make a good day even better. The Tippy Assam is definitely my favourite tea. It is a strong black tea with a Malty taste. Perfect to pair with a hearty English Breakfast. The lush lowlands down by the Brahmaputra River are home to hundreds of tea gardens: 765, to be precise. Tea plantations were first introduced to India by the British in the 19th century, after Robert Fortune stole Chinese tea cuttings to plant in the Himalayan region of Darjeeling. Today Indian tea is some of the most famous in the world: it's also home to Assam tea, found growing wild there by the Scottish explorer Robert Bruce.